Holidays in Playa Mujeres offer a classic Caribbean getaway, with long stretches of gorgeous white sand, swaying palm trees and inviting turquoise waters. 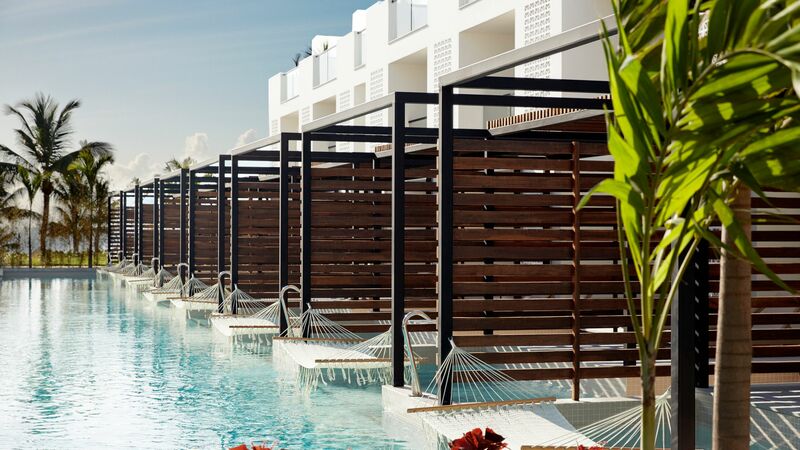 Located just north of lively Cancun, Playa Mujeres oozes laid back luxury in the surrounds of pristine landscapes. Adventurers will love exploring the Chacmochuc Lagoon Nature Preserve, which comprises of nearly 2000 hectares of mangrove forest which surround the resort. Playa Mujeres is the perfect location for golf enthusiasts, with Playa Mujeres Golf Club being one of the best courses in Mexico. The 18 hole course was designed by golfing legend Greg Norman, and is nestled in a tropical jungle, stretching out over 930 acres. If golfing isn’t your thing, the island of Isla Mujeres is sure to inspire you. It’s the perfect location for diving or snorkelling, with calm waters and beautiful coral reefs. At the Southern tip of the island, there’s even a sea turtle sanctuary and the remains of an ancient Mayan temple to discover. Luxury holidays in Playa Mujeres bring you upmarket amenities accompanied by classic Caribbean beauty. It may just be the hottest resort in the area; featuring a generous selection of modern shopping malls, restaurants and bars, as well as a variety of golf courses. Spend your days relaxing on the beach and enjoying the beautiful landscape, exploring the incredible coral reefs through snorkelling or diving trips or practising your swing at Playa Mujeres Golf Club. Be sure to head to the marina at La Amada, where you’ll be graced with rows of luxurious yachts - those who enjoy yachting shouldn’t miss a trip along the coast here. 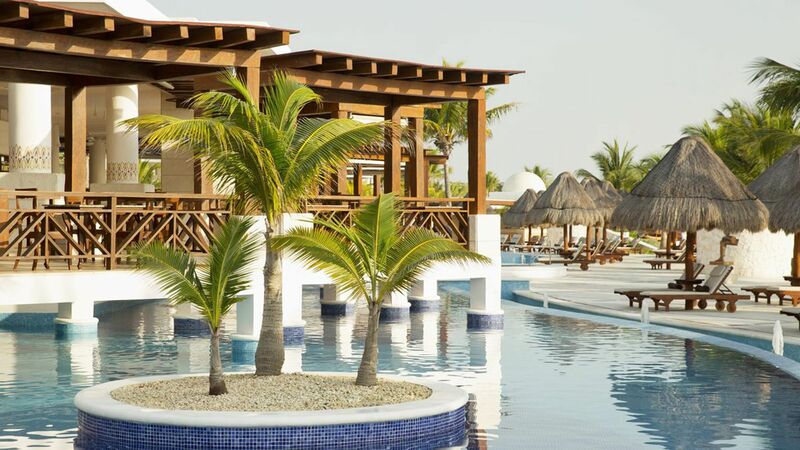 For the ultimate taste of luxury, Sovereign recommends a stay at Excellence Playa Mujeres. This hotel is exclusive for adults, and offers a romantic getaway in an incredibly picturesque location, with two miles of beach right on its doorstep. It’s no surprise that Excellence Playa Mujeres won “Best All Inclusive Resort in the World” in 2016, and here you’ll find seven swimming pools, incredible dining experiences and a world class spa offering couples’ treatments. Believed to have been one of the biggest Mayan cities, Chichen Itza’s sprawling architectural delights make it one of Mexico’s most-visited sites. Look out for El Castillo, the famous pyramid-shaped temple, and the huge ball court where ritual games were once played. Playa Mujeres is an easy 20-minute drive from the cosmopolitan city of Cancun, Mexico’s beating heart and party central. Head for the Avenida Kukulcan for the best pick of the shops, as well as a diverse restaurant scene and plenty of entertainment. This tiny island off the coast is all about the sea; as well as the fantastic diving, it’s home to a fascinating underwater museum and a sea turtle sanctuary with its own aquarium. The seafood here is the freshest you’ll ever get – lobster and huge shrimps are always on the menu. Transfer time from Cancun airport to Playa Mujeres is approximately 30 minutes.